This band basically were the straight out godfathers of Thrash Metal in Canada... along with others like Infernal Majesty and Razor in the 80's. I was one of their biggest fans, and saw them once when they had played in my home town at the height of their popularity back then. Now, I sort have been let down as I hear this new album. "Thrash, Speed, Burn" was sort of a great name for the new album, although Exciter were probably not thinking of it in the way I am. The band does still very much 'Thrash'... very good in fact, showing that time has not deadened the power that this amazing quartet has shown over the two decades plus they have been around.. Next is the word 'Speed', and is referenced thorough the fact that they do have major riff capabilities in a big way. They can still play at an amazing rate of speed, showing that they all have became very accomplished at what they were doing through out the years. Sadly the last word in the album title, 'Burn', described that even with all of this constant and very amazing talent they still hold, the album as a whole just seems to fizzle out and tragically dies. The album had great potential for an amazing sort of comeback for the Canuck thrashers, despite sounding a little dated throughout... the album just seems to not stay with me and makes me hungry to hear more from them from the past. I am unsure of exactly what it is with this album, but it just seems to never get going. 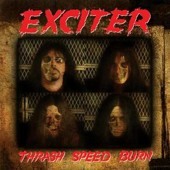 Exciter might get some new fans, and some of them will go back and revisit some of their older releases (I would recommend the classic LP "Violence And Force")... but for a old thrasher like me who remembers the early scene, "Thrash, Speed, Burn" was simply a more than just little disappointing. It was a let down, but not a out and out heartbreaker either. We will just say it was sadly average and leave it at that.